Pope Pius XII is seen at left in an undated photo. At right, St. Peter's Basilica is seen in 2005. 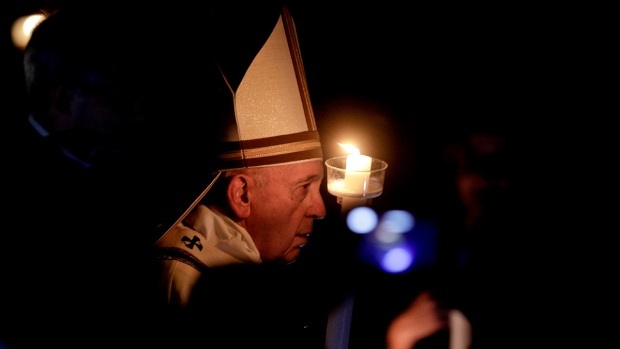 Declaring that the church "isn't afraid of history," Pope Francis said Monday he has decided to open up the Vatican archives on World War II-era Pope Pius XII, who has been criticized by Jews of staying silent on the Holocaust and not doing enough to save lives. Describing that criticism as fruit of "some prejudice or exaggeration," Francis told officials and personnel of the Vatican Secret Archives that the documentation would be open to researchers starting March 2, 2020. The move could speed up Pius' path to possible sainthood, a complex process that in Pius' case bore the weight of questions of what he knew and did about Nazi Germany's systematic killing of Europe's Jews. 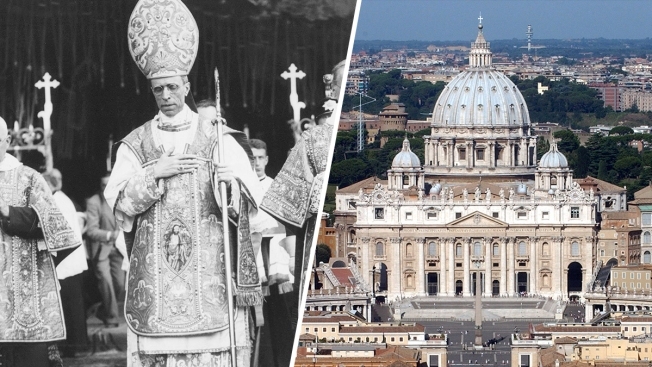 Pius was elected pope on March 2, 1939, six months before World War II erupted in Europe. He died on Oct. 9, 1958, at the Vatican summer residence at Castel Gandolfo, near Rome. The Vatican usually waits 70 years after the end of a pontificate to open up the relevant archives. But the Holy See has been under pressure to make the Pius XII documentation available sooner and while Holocaust survivors are still alive. "The church isn't afraid of history," Francis told the archive staff. He said the Pius papacy included "moments of grave difficulties, tormented decisions of human and Christian prudence, that to some could appear as reticence." Instead, Francis said, they could be seen as attempts "to keep lit, in the darkest and cruelest periods, the flame of humanitarian initiatives, of hidden but active diplomacy" aimed at possibly "opening hearts." Francis words appeared to echo the long-held Vatican defense of Pius which maintains that the Italian pontiff used behind-the-scenes diplomacy to try to save lives. Eugenio Pacelli, the future Pius XII, gained diplomatic experience in the period following World War I, serving the Holy See in postings in Munich and Berlin in Germany. In Jerusalem, the Yad Vashem Holocaust memorial commended Francis' decision, expressing the expectation that "researchers will be granted full access to all the documents stored in the archives." Those hailing the decision to open the archives also saw usefulness in dealing with present challenges of anti-Semitism and religious persecution and not just deepening understanding of the past. Israeli President Reuven Rivlin called opening the Vatican archives "particularly important in these days of ongoing anti-Semitic attacks, the rewriting of history and attempts to deny the Holocaust." Rabbi Arthur Schneier, a Holocaust survivor who has led a New York synagogue in New York since 1992 and received a papal knighthood four years ago for his activism promoting religious freedom, said "the archives will reveal what was done and what could have been done in the face of Nazi tyranny, particularly the persecution of the Jews that led to the Holocaust." The archives "might also be a useful instrument on how to deal with dictators of our day who disregard human life, human rights and inflict suffering on their people," said Schneier, who heads the Appeal of Conscience Foundation, which advocates for religious freedom and human rights. Vatican archivists had already started preparing the documentation for consultation back in 2006, at the behest of Francis' German-born predecessor, Benedict XVI. For decades, Jewish advocates had lobbied for access to the documentation to help answer the long-standing question of whether Pius did all he could to save lives during World War II. In New York, Rabbi David Rosen, the international director for interreligious affairs at the American Jewish Committee, called Francis' decision "enormously important to Catholic-Jewish relations." He noted in a statement that he had raised the issue with Francis and his predecessors in meetings. "It is particularly important that experts from the leading Holocaust memorial institutes in Israel and the United States objectively evaluate as best as possible the historical record of that most terrible of times — to acknowledge both the failures as well as the valiant efforts made during the period of the systematic murder of 6 million Jews," Rosen said. Monsignor Sergio Pagano, in charge of the Vatican Secret Archive referred in comments Monday to the thousands and thousands of files, letters and other material to be made available. Writing in Vatican newspaper L'Osservatore Romano Monday, Pagano said the archives "spoke, speak, and, I hope, will speak to researchers and to historians of an almost superhuman work of Christian humanism" amid mid-20th century events "that seemed determine to annihilate the very notion of human civilization." Defenders of Pius' wartime actions have noted that some convents and other religious institutes in Italy helped hide Jews, including during the Nazi occupation of his native Rome. It was during Benedict's papacy that the Vatican in 2009 formally recognized the "venerable" qualities of Pius, an early step along the possible path to sainthood. Historians will also be keen on examining documents from Pius XII's papacy in the years after the war ended in 1945. In 1983, the Vatican dismissed as "absolutely absurd" a claim in a Jewish magazine that the Vatican aided Klaus Barbie and other high-ranking Nazi war criminals in their escape from Europe, along with legitimate refugees, after the war.